Sutherland is the coldest place in South Africa. On our recent visit to the Karoo we took a drive from Matjiesfontein to Sutherland. Travelling to Sutherland feels as if you are on a journey to the centre of the earth. The road from Matjiesfontein appears to go downhill all the way through valleys, mountains and hills. As far as the eye can see there are hills, and behind them valleys with more hills stretching into eternity. The fields were green as it had recently rained and here and there the odd flower was blooming. The fields themselves were interesting as well. Some of them were strewn with rocks where others had very few. It looks as if a mountain or something has blown up and spread splintered rocks all over the place. Some of the mountains have very interesting shapes. These stem back to milllions of years ago when Gondwanaland was still having an influence on the land. Apparently the whole area was one big marshland with lots of volcanic activity and what we see today are the leftovers after the waters have dried up and erosion has done its work. Many of the hills that have been pushed up by the pressures that were exerted on them millions of years ago look like large dinosaurs with fins running along their backbones. Some of them even look like our modern day dragons. It is however interesting that there is so much land such a short way from Cape Town that is totally uninhabited. The road to Sutherland is about a 110 kilometres long and in that distance one comes across two or three farms along the way. Some of the farmhouses are built along the rivers which run through the valleys. When I visit such desolate places I always imagine what it must have been like for the explorers who first visited these areas back in the 1700's. There were no roads, no places to aim for and lots of wild animals. How did they come across a place like Sutherland and what made them decide to build a town there. 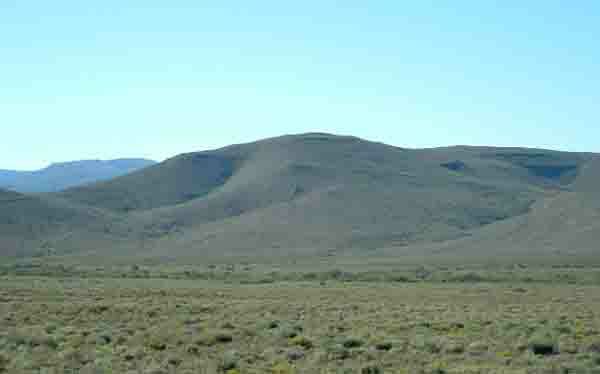 Sutherland other than being one of the coldest places in South Africa is well known for its observatories. At present a telescope that can see a candle flame on the moon is being built in the area. How powerful is that? It's called the SALT telescope . (South Africa's largest telescope) The new telescope will have a mirror of 11 metres in width. Before it can be installed the road from the town to the observatory has to be tarred. 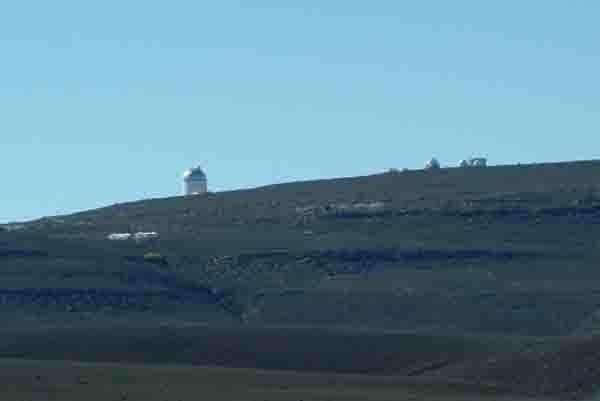 The observatories are positioned on a hill about 15 kilometres east of Sutherland and are apparently the same height above sea level as the Brixton tower in Johannesburg. Why are the telescopes built so far out in the wilderness? The answer is that there is no interference from artificial light and that there is very little pollution in the sky. It's also the reason why it gets so cold as there is no cloud protection to warm up the town at night. Sutherland is a one horse town, far away from the city lights and with very little to offer its inhabitants. It however has a number of attractions to interest the visitor who takes the time to drive the 110 kilometres to get there. The N G Church is a large buiding which can house about 1200 people when full. During the Boer war it was invaded by the British troops for about 8 months. I'm sure it was not used as a church then. The highway into the town has plinths for the 9 planets of the solar system and these are built to scale representing the sun and the planets in size and distance from each other. The Verlatenkloof pass into town is interesting with its high rock walls. When we drove through it there were warnings of rockfalls and one had to take a chance of being hit by a falling rock. A British soldier who died in a flash flood in the town has his grave in the local cemetry. What is interesting about this grave is that after the Boer war the Britsh sent a military cross to South Africa. The soldier was exhumed from his first grave and placed in a second one thus being one of the only people in the town to have been buried twice. There are also a number of interesting farms in the area which produce cheese from sheep's milk and grow tulips in the middle of the Karoo. I thought they came from Amsterdam . For those who like exploring out of the way places Sutherland is the place to visit. It will take you years to explore every rock and crevice in the area.